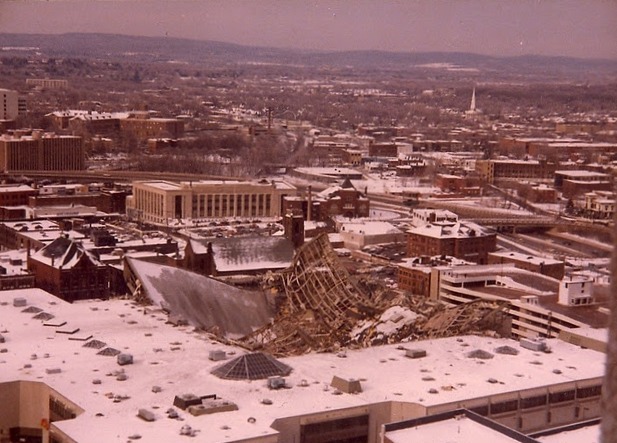 On January 18, 1978, at about 4:20 in the morning, the Hartford Civic Center roof collapsed. Ten days of bad weather coupled with a snowstorm the prior evening were responsible for the weighty accumulation of snow and ice that led to the rooftop’s failure. Planned in 1970 as part of Hartford’s downtown revitalization efforts, the Civic Center opened in 1973. For the roof, the building’s designers proposed a space frame design. Daring and innovative for its time, it consisted of two main layers composed of horizontal steel bars with horizontal and diagonal beams that supported the two layers. Builders fabricated the 1,400-ton, 108,000-square-foot roof on site and raised it into place with temporary lift towers. They then built concrete support columns inside the towers. After the builders completed the roof, they then constructed the arena around it. The night before the roof caved in, the Civic Center hosted a basketball game between the University of Massachusetts and the University of Connecticut. (UConn won the game.) Luckily, all spectators and crew had left the building for that evening, and no one was hurt. Builders’ re-fabricated the roof soon after its collapse, reinforcing it by building a structure similar to a railroad truss bridge. The Civic Center reopened in 1980. At the time of the incident the arena was home to Connecticut hockey team the Hartford Whalers and hosted large events, including UConn men’s basketball games. Known today as the XL center, the coliseum has operated without incident for over 30 years and still hosts college basketball games, a hockey team, and numerous concerts and events each year.